Elisha Koech is originally from a town called Eldoret, located in western Kenya. 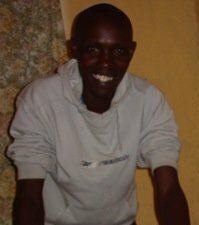 He moved to Nairobi to pursue a running career, trained for a period of time in Sweden and is now back in Kapsabet, Kenya where he currently resides. Word is that he’s currently training for the 2011 Stockholm Marathon coming up on May 28. As our first Non-American Writer for EntertainingYourself.com, Elisha brings a fresh, positive spirit filled with optimism and delight. Now if only we could get him to stop running long enough to write more articles! EY: How would you sum up your life’s philosophy? Elisha: Happiness, in most cases, is a matter of choice, so I spend most of my time thinking of the positive things in my life, not dwelling on the setbacks. Elisha: As the saying goes, everything is possible if you believe! As a boy, I had dreamt of following the footsteps of the great runners of my country Kenya. Now I am living this dream. And, not only am I having a chance to run, but I’m living in another country, experiencing a whole new side of life. And I can tell you this, when I touched down in Sweden, I knew that the future would only bring more experiences to strive for. EY: That’s why we love you – your life story makes us all believers!